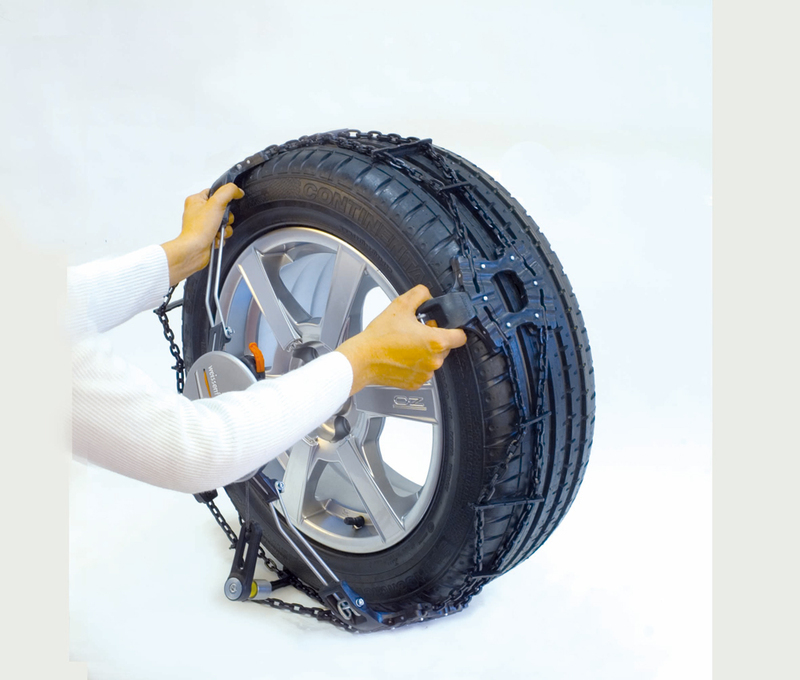 Weissenfels Clack & Go Quattro - The automatically self-centering and self-tensioning snow chain that doesn't have any components protruding at the rear side of the tyre! If you change your car and need a different size or type you can take advantage of our unique Weissenfels Clack and Go Quattro snow chain exchange service. 0 mm projection. No minimum clearance behind the wheel required. Total absence of chain parts on the inner side of the wheel. 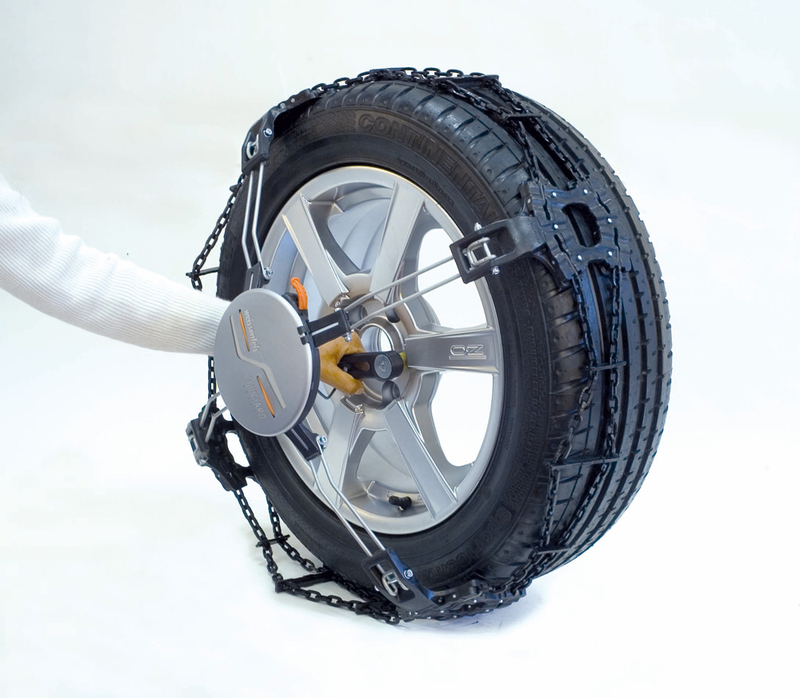 Can be fitted where it would often be impossible to fit normal snow chains. Weissenfels Clack & Go Quattro has been designed not only to be extremely simple and quick to fit but once fitted they automatically tension as the vehicle starts to move forwards. Since there is absolutely nothing that protrude behind the wheel, Weissenfels Clack & Go Quattro is ideal for fitting to passenger cars such as many of the models in the Audi, BMW and Jaguar ranges whereby often there is insufficient clearance behind the wheels to fit conventional wrap around snow chains. This means that that any obstructions such as brake components, steering, suspension parts or bodywork on the inside of the tyre are totally unaffected. 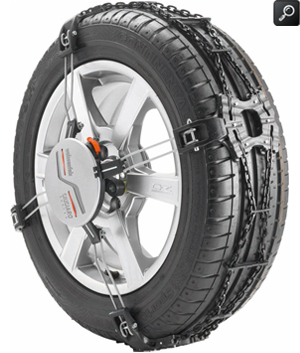 Weissenfels Clack & Go Quattro snow chains will fit virtually all makes and models of cars, crossovers mpv's and suv's up to a gross weight of 2500Kg. 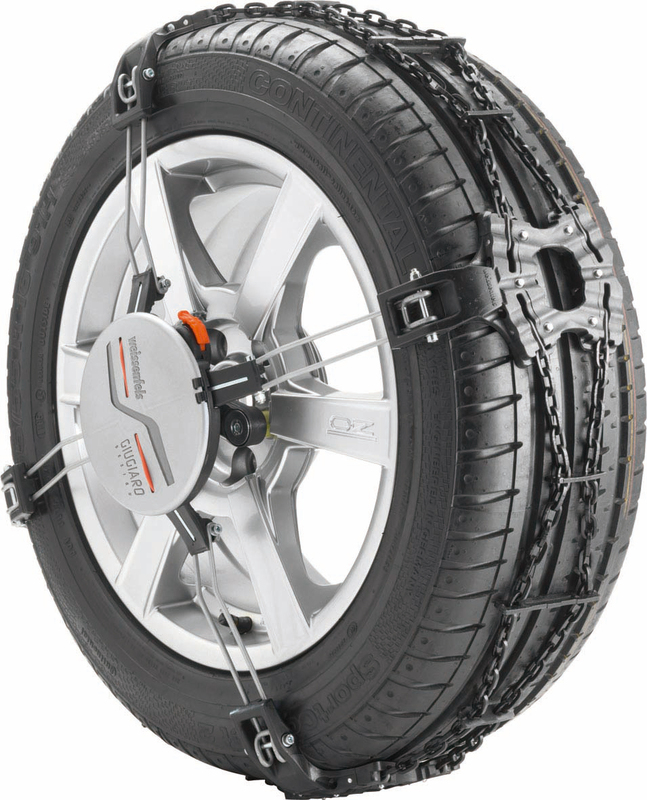 Since they incorporate a generous multi adjustable fitting system each chain size adapts to a huge range of tyre sizes, many more than with conventional snow chains. 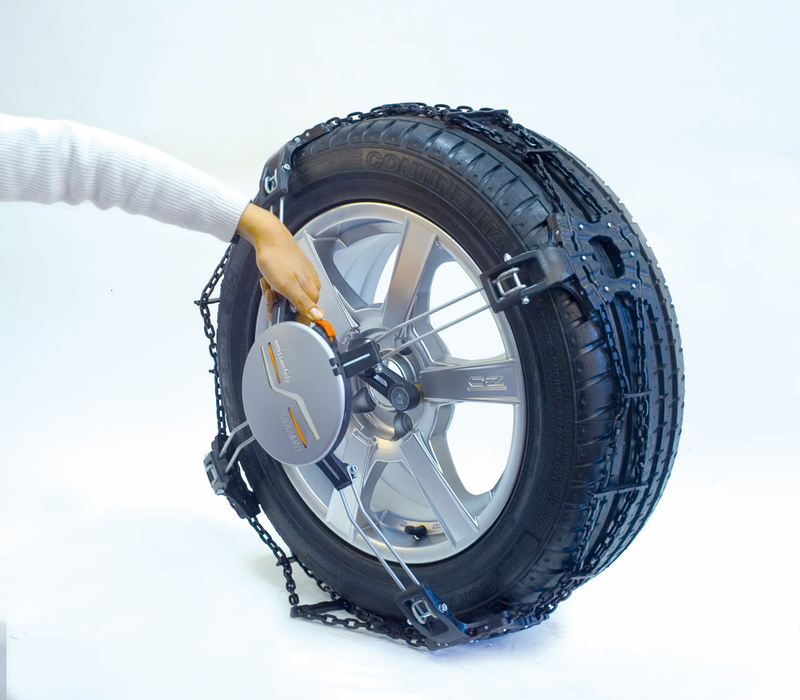 For example the entire range of tyre sizes is covered by just six Clack & Go Quattro chain sizes as compared to at least fourteen sizes with other models of snow chains that cover a similar range of tyre sizes. The amount of grip on snow and ice is quite simply amazing. This is thanks, mainly due to the unique combination of a continuous 15mm square linked snow chain pattern which incorporates a series of special lateral steel traction plates across the tyre tread as well as a plentiful amount of hard wearing ice studs. Once set up for your particular vehicle's tyre size (a simple once only procedure) fitting can be accomplished in a matter of seconds. The chain is simply attached to one of the car's wheel studs or wheel nuts using a special gripper collet. Once attached the chain assembly is placed over the tyre, the tensioner activated and will then tension itself as you drive. What could be simpler? Sizes F10, F20, F30 and F40 include wheel bolt/nut adapters for 17mm and 19 mm wheel bolt and nuts. Sizes F41 and F51 include adapters for 19mm and 21mm fitments. 17, 19, 21 and 22mm adapters are also available upon request. Weissenfels Clack & Go Quattro snow chains are supplied in a handy "twinset" carrying case which, keeps the two chains separate and if required, can be separated in to two pieces to make storage in the car boot even simpler. Automatic self-centering and auto chain tensioning as you drive. Cannot come loose! Weissenfels Clack and Go Quattro snow chains are supplied in pairs in a neat "twinset" carrying case with illustrated easy to follow fitting instructions, spare emergency repair links and a pair of plastic gloves. The "twinset" carrying case can be zipped together; so you have the choice to either store the chains separately or together.